It's Not Work, It's Gardening! 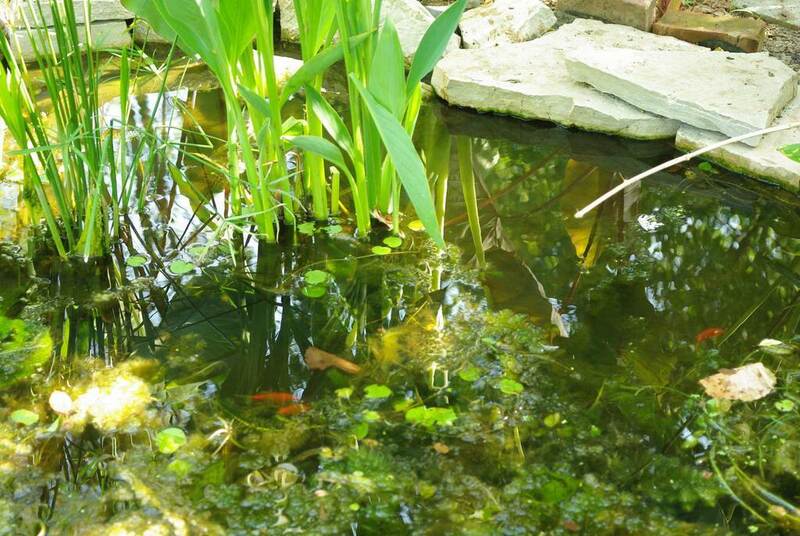 : Pond gets better, and fish! 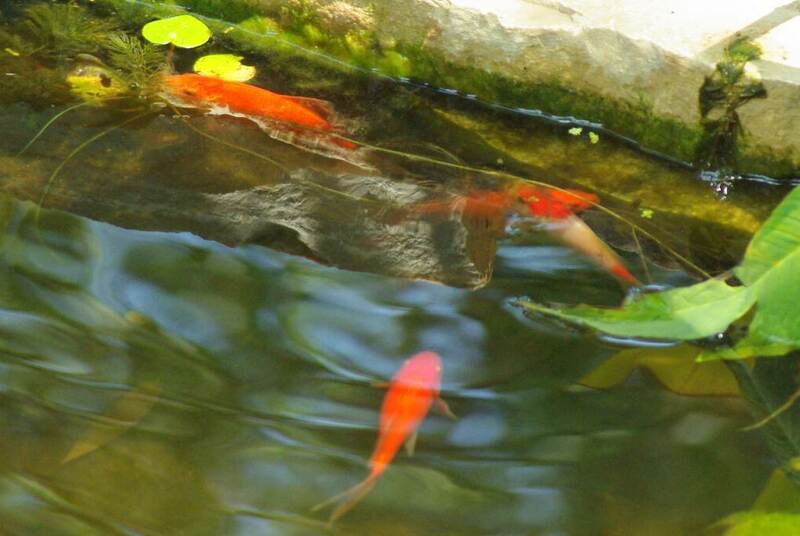 Pond gets better, and fish! 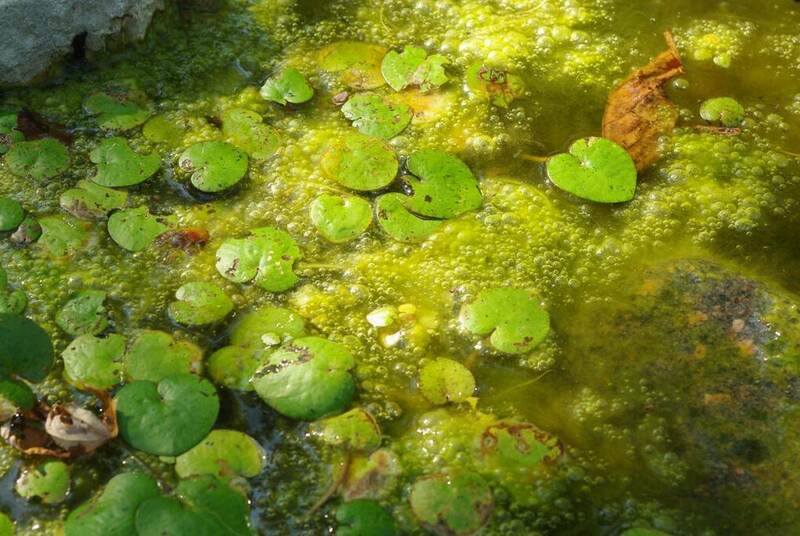 The pond is getting better, as the algae problem is lessening. It may not look like it here, but it is. 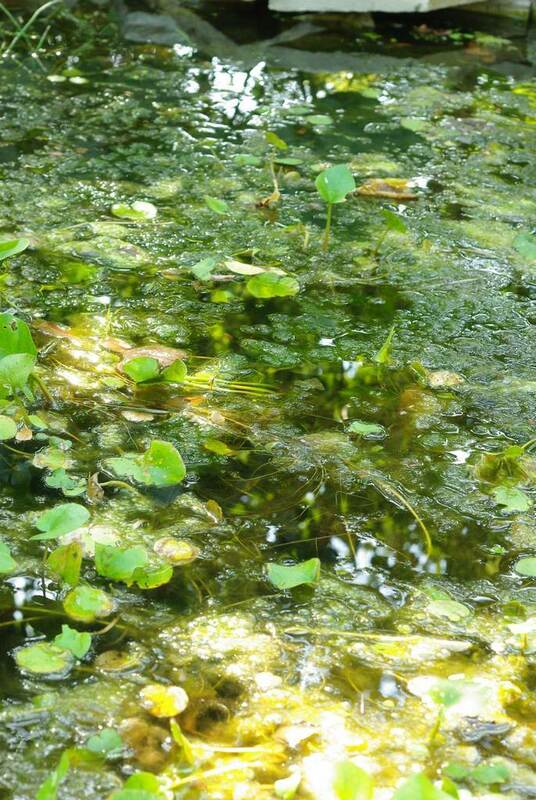 I've been adding beneficial bacteria to the water twice a week for almost two weeks now, and it's been hungrily eating all of the extra organics in the water (from the leaves, maple seeds, and other things that have fallen into the pond that I couldn't remove). 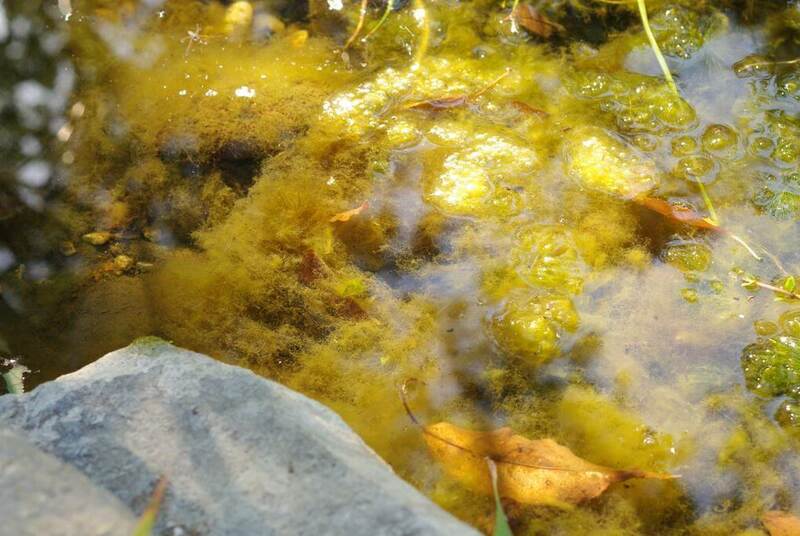 This stuff was providing the extra nutrients that the algae was thriving on. Fewer leaves and bare stems usually indicates munching, and I don't envision rabbits or woodchucks taking a swim. 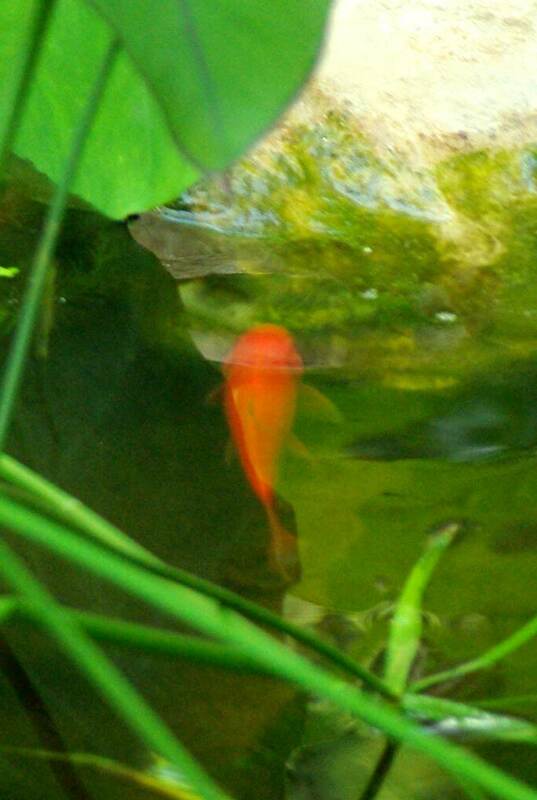 The goldfish! See those three spots of orange? 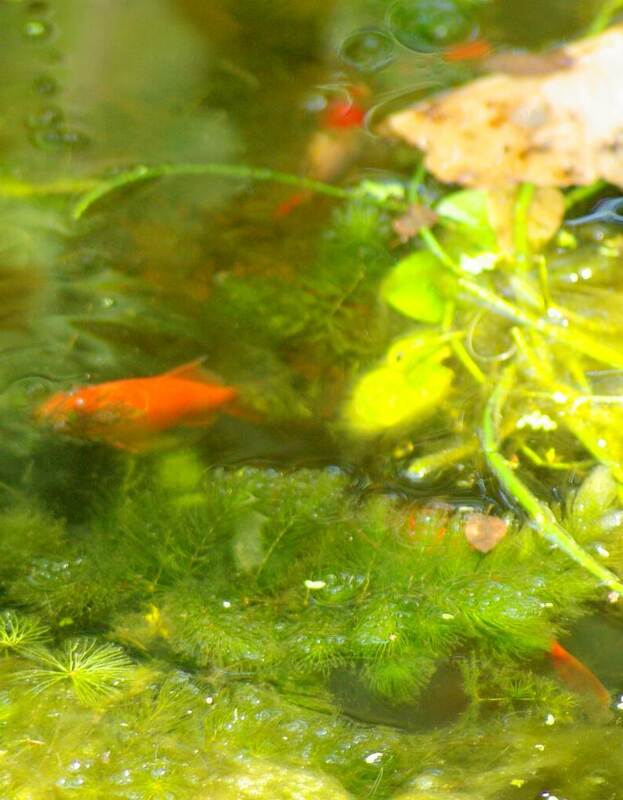 These fish are wild and shy, and hide as soon as you walk up to the pond. They've never been fed, so they don't have the "human equals food" conditioning. They only relax and start venturing out of cover after you've been standing still for a little while. You can see the last little bit of leaf sticking out of this guy's mouth before it goes down. I was expecting the duckweed to take over, but there are only small bits of it around. I guess the fish have developed a taste for it and are keeping it in check. They've at least doubled in size in the five weeks since I released them, so they're finding plenty to eat. They must be eating mosquito larvae too as I haven't seen any, although there are nooks and crannies in the shallows where those pests could probably develop unharassed by fish. 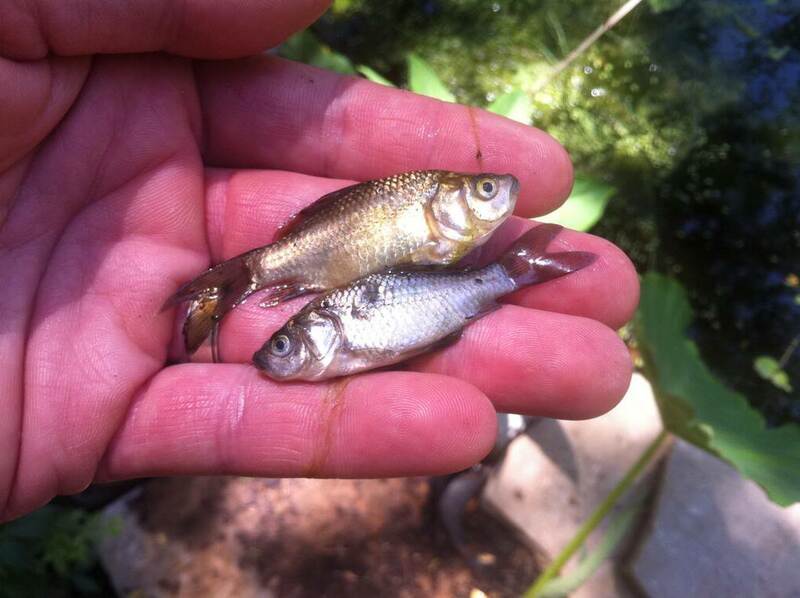 It's been so dry here in St. Louis that mosquito populations are down anyway, but I like to think these fish are helping. I think I've found four dead ones, which should leave 11. It's my own bigfoot sighting photo: blurry and poor quality but so exciting to those who are into it! 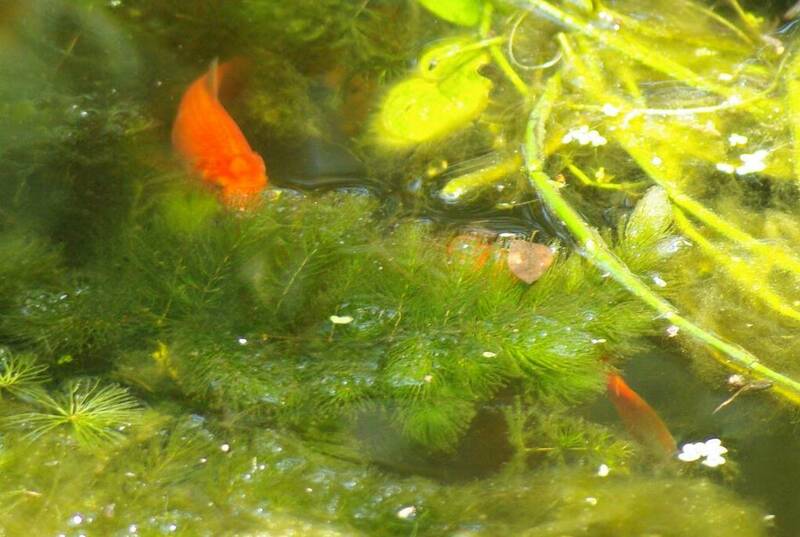 So that makes nine fish that I know about... assuming that none have died since I saw those eight at once. There are so many places to hide, it doesn't surprise me that I can't get an accurate count. 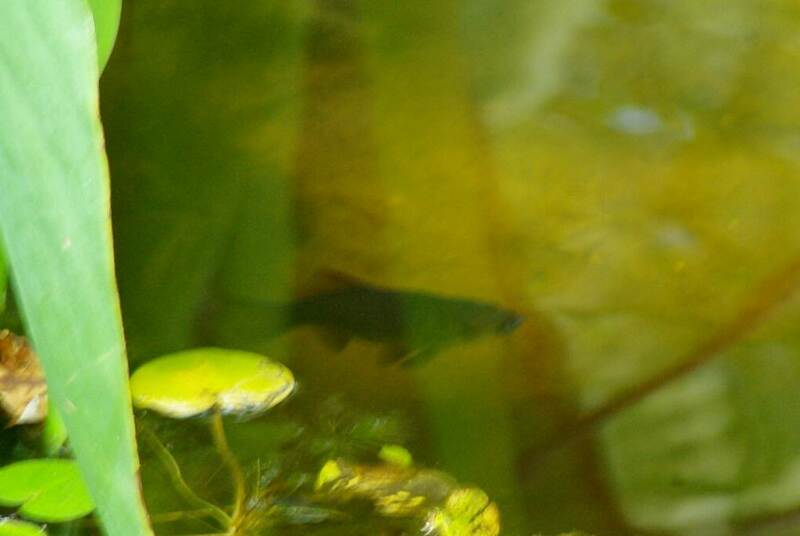 The hornwort has grown so crazily, I wonder if any of it that I sank is still growing underwater or if it has all floated back to the surface? 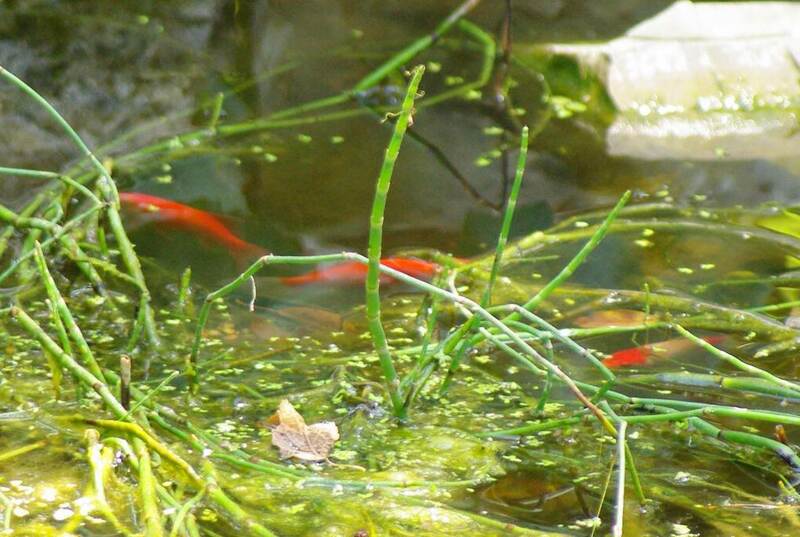 Even though I don't get to see them very clearly, having these fish in the pond just makes the whole thing so much more enjoyable and worthwhile. 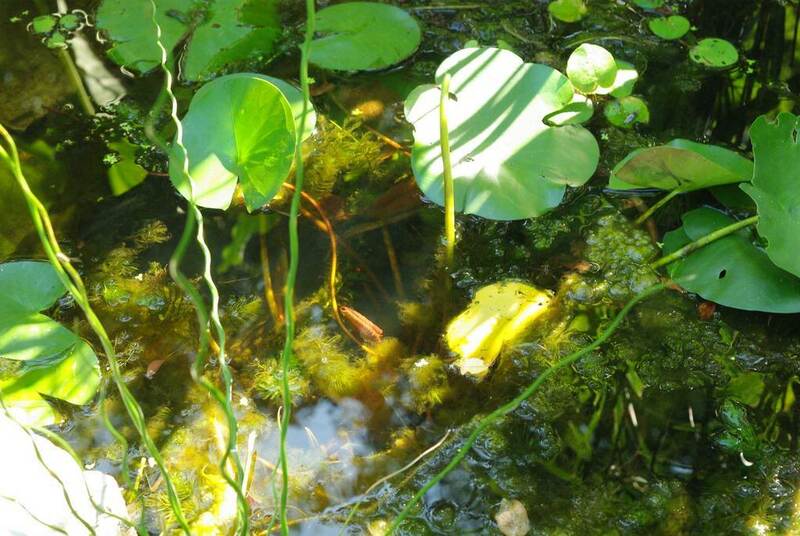 Gotta love a pond that's alive! 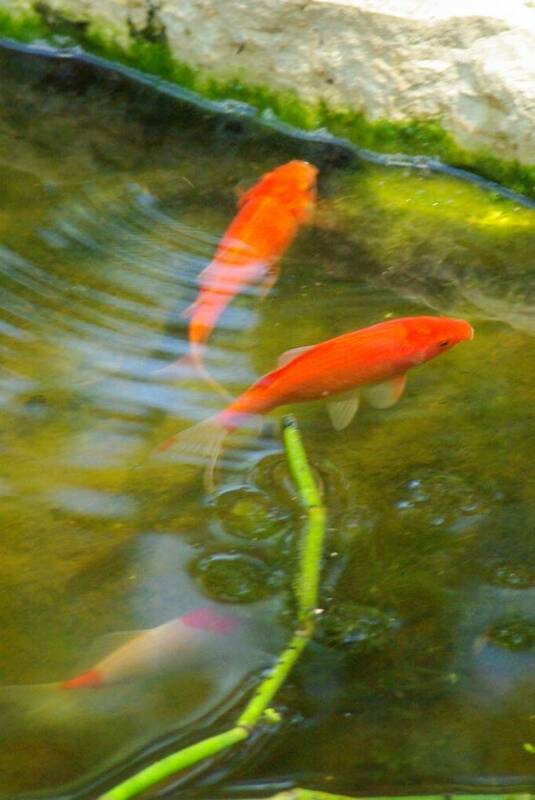 Looks like you're starting to get the balance already in your new pond. 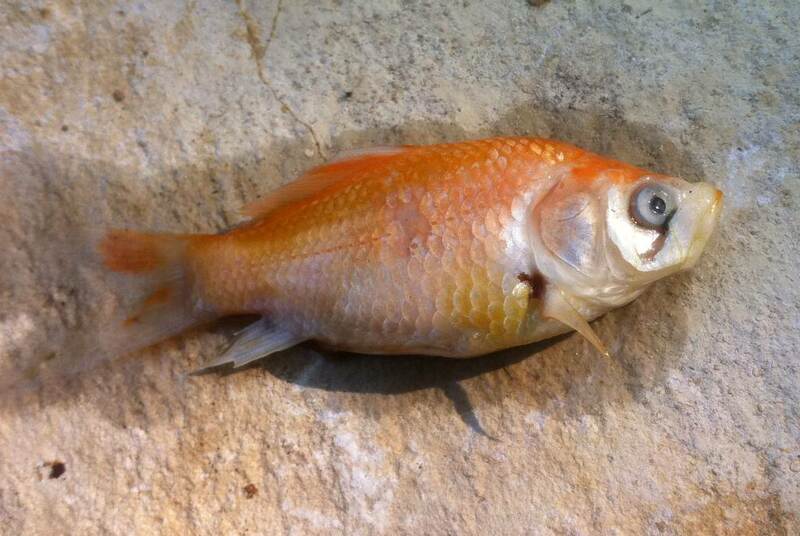 Shame a few fish died but it's not that unusual to have a few casualties when you introduce new fish on a wildlife pond. Alan, You would love purple pickerel weed. Give it a shot if you see it at a garden center! Happy "ponding!" 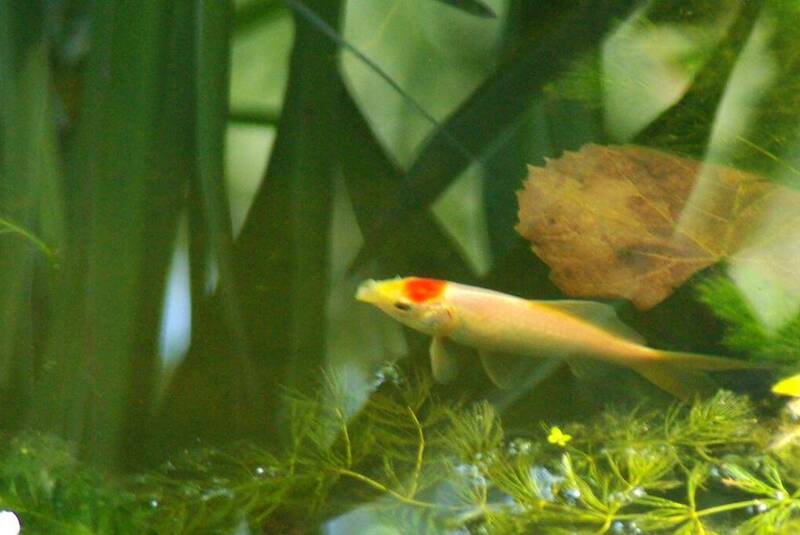 The flashes of color in your pond make it seem more alive and interesting! 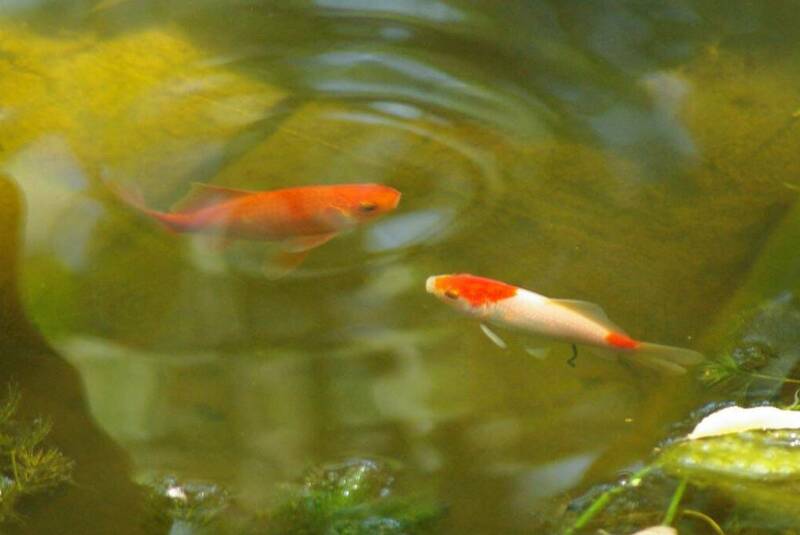 Hooray for goldfish! That's so cool! 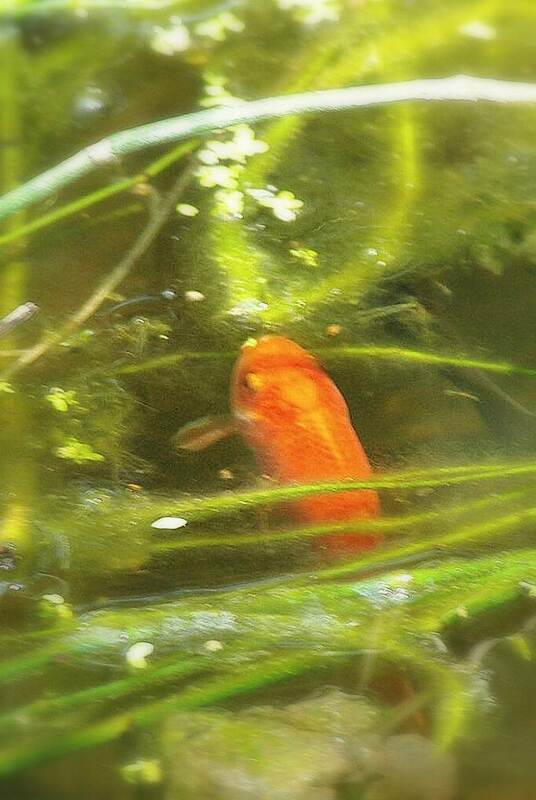 are you planning to "condition" your fish in the future, so you can take pictures of them, or just keep them "wild"?